Judging by the number of people with iPhones in Singapore, one might think Apple products are given away with every plate of chicken rice. A recent tongue-in-cheek listing of the “world’s coolest nationalities” ranked Singaporeans #2 for taking geekiness to the extreme level, citing facts like Singapore is home to a 9 year old boy considered to be the world’s youngest app developer. With one of the most tech savvy populations in the world, it’s not surprising there are lots of apps for making life in Singapore a little easier. Here are some of the best free Singapore apps to keep you busy. Singaporeans hate to waste calories on mediocre food so there are plenty of apps to help choose a restaurant. SoShiok (a Singlish term for excellent) is compiled from reviews by the Straits Times’ food critics and can also recommend a restaurant based on cuisine type, price, or neighbourhood. This app is a godsend if you’re looking for a particular store on Orchard Road or one of the mega-malls. Simply type in the name of the store and it’ll give you the address and phone number. You can also browse complete mall directories and view maps and directions to the most popular ones. Check out what’s on at twelve of Singapore’s most popular venues, including the Esplanade Theatre, Marina Bay Sands, and Singapore Art Museum. It’s not perfect, but it’s the best current events app out there and dead simple to use. Whether you’re killing time between flights or simply want to know when’s the next flight to Siam Reap, this app’s got Changi Airport covered. Features include terminal maps, store listings, a dining guide, promotions, and arrival/departure information. Brush up on your “Singlish” with this talking app that includes 80 uniquely Singaporean expressions and their meanings. The phrases range from holiday greetings to coffee shop slang — – perfect if you’re not confident how to pronounce “kopi o”! 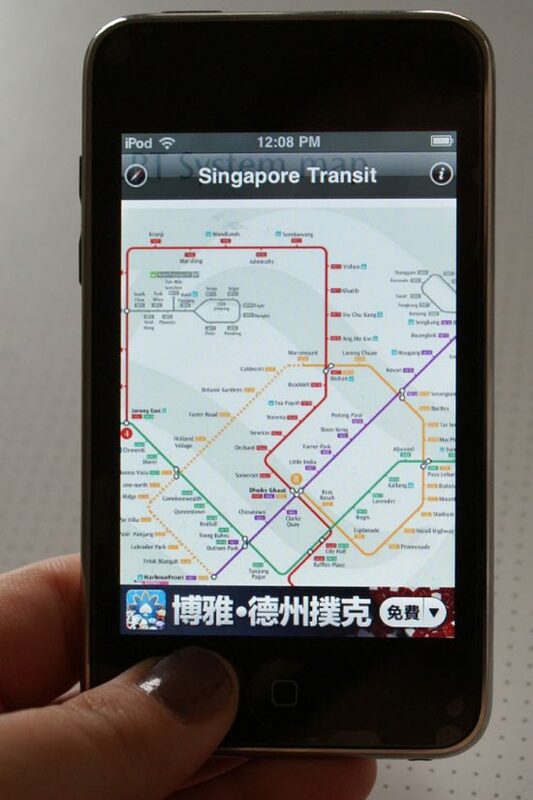 From bus schedules to taxi phone numbers, this app offers everything you need for efficiently getting around Singapore. The downside is that it’s not much use without an internet connection, but at least the subway map still works.